Step1. This is a source code of the FM. Step2. Let’s dynamically call the FM in a report and execute it. Step4. So here we have the O/P. Step5. Again give a Fm name which may not exist and execute it. Step6. So we receive a dump while calling the FM dynamically. Step7. In order to validate the FM which is called dynamically one standard Fm is there which can be called before actually calling the FM dynamically. Step9. In a success case we have the normal output of the FM. Step10. Let’s try to give a FM name which doesn’t exist in the system. Step11. 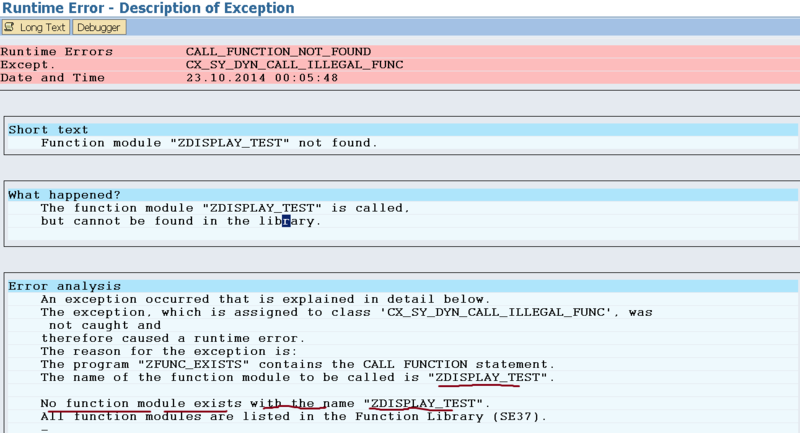 Here we receive the validation error not a run time exception.